French firm DBV-Technologies is working on what could be a real breakthrough in the field of allergy diagnosis and treatment. Why not click here to find out more about the techniques that are behind their innovative approach? Central to DBV-Technologies’ drive to bring relief to the millions of victims of allergies such as peanut allergy, house dust mite allergy and cow’s milk allergy is the Viaskin® patch. The image below displays the main features of the patch. 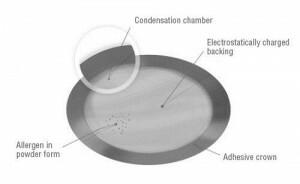 These include the condensation chamber, which helps keep the skin moist as the allergens are delivered to the patient’s immune system, and the electrostatically-charged backing. This special backing works in tandem with the electrospray used to spray the proteins (the powdered allergens) onto the patch. It ensures that the layers of protein on the patch are spread evenly across the patch. It also means that no wastage occurs during the spraying procedure. As the quantities of protein sprayed on the patch can be adjusted down to practically the last microgram, this method is suitable for treating patients across the whole spectrum of allergic reactions, from mild to severe.